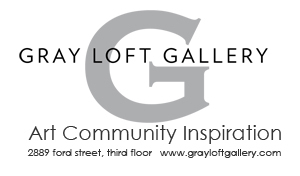 Join us for the 2nd Friday reception at Gray Loft Gallery, 2889 Ford Street, third floor. The current show is “The Big Painting Show – Layers of Abstraction” which features the work of eight Bay Area Painters. It’s a stellar show not to be missed. Please stop by and support Jingletown Galleries! Apples and Oranges, White Wall Gallery, The Clock Tower Studio and Gallery and Float Gallery will also be open for the 2nd Friday Art Crawl. Join us!